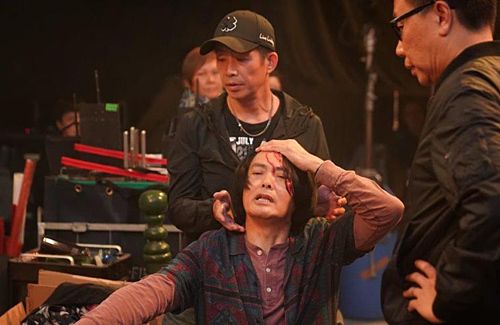 While filming an action and chasing scene for the new Hong Kong film, Sun Years <驕陽歲月>, Chow Yun Fat (周潤發) was unfortunately injured on set. However, the 63-year-old disregarded his wound and continued to film the scene to its completion before motioning for medical attention. Once the scene successfully concluded, Chow Yun Fat gripped the open wound on his head and asked if there were any medical professionals on set. With blood dripping down his face, he found his own way to a chair and calmly asked for a towel to compress the wound and clean water to wash it. Despite his injuries, he continued to reassure his worried costars and the behind-the-scenes staff not to worry and that he was fine. A staff member parted his long hair, which was grown out for his role in the movie, and inspected the wound. They decided that it was best for him to head to the hospital for stitches. Want to see that scene in the movie. What a tough 63 year old man….